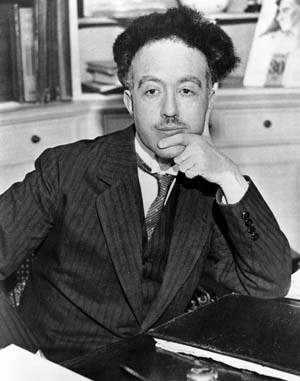 Louis de Broglie (1892-1987) was a physicist famous for his quantum theories and his terrible haircut. FUN FACT: It's pronounced "de Broy"
In 1923, he published several papers on light quanta and prepared his doctoral thesis, in which he whined that nobody has managed to prove whether light was a particle or a wave. Through that he claimed that: "All matter has both particle and wavelike properties. He developed the idea mathematically, linking all mass with a wavelength known as matter waves. de Broglie's proposal revolutionised modern physics and gave birth to the new field of quantum physics. Quantum Physics was a field where the wave-particle duality of matter is focused on. de Broglie's mathematical delvings and his proposal that electrons could be diffracted had great impact on the scientific community. This new field of physics attracted other major scientists, like Pauli, Heisenberg, Schrodinger, Dirac and others. Quantum mechanics describes a set of physical laws that apply to objects smaller than the size of an atom. Also, it is shown later that De Broglie's allowed Bohr's stationary states to be adequately explained.